They tried to destroy our planets. Our way of life. They tried to send us into extinction. But we, the Coalition, fought them and won. That was a decade ago. They’re known as the Host: a cabal of aliens seeking to dominate our sector of space. And they’re back - with help from a powerful new enemy. We’re outnumbered and unprepared. But there is hope. 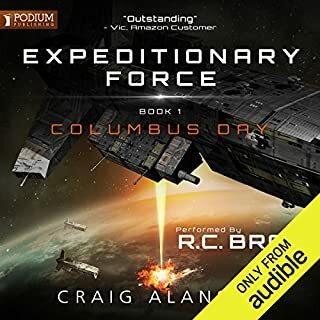 An ancient race of long-dead but technologically advanced aliens called the Navigators have a ship called the Blackstar that could potentially turn the tide. That is if I, Kai Locke, a humble ship racer, can find it and learn how to harness its power in time. Colonel Joe Bishop made a promise, and he's going to keep it: taking the captured alien starship Flying Dutchman back out. 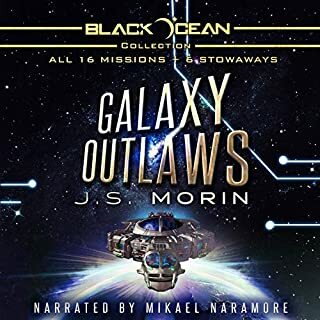 He doesn't agree when the UN decides to send almost 70 elite Special Operations troops, hotshot pilots, and scientists with him; the mission is a fool's errand he doesn't expect to ever return from. At least this time, the Earth is safe, right? The story seemed forced and less important then book 1. What really started to bother me was the same 2 or 3 scenerios kept playing out over and over. Skippy has no plan, Joe comes up with plan, Skippy cant believe a monkey came up with a plan. Tbat happend about 5 times i swear. Even phrases and information was repeateded. The performance was top notch, the writing was lazy. What did you like best about SpecOps? What did you like least? I really liked the first book despite instances of poor dialog. The universe Alanson has built and the plot itself is engaging. I picked up the second book thinking that these issues would be resolved after the first, but I was wrong. They only became worse. a) So much repetitive language. The author seems reticent to use pronouns instead of repeating the same noun within a 1-3 sentence span. b) All conversations with Skippy just get more and more annoying. The same jokes are used on repeat and they were only marginally funny the first time. c) besides the main plot line and the universe the characters inhabit, this reads like a sub-par fan fiction. the protagonist is self-indulgent; it sounds like the internal dialog of someone in middle school. d) the jokes are awful. a lot of 3-stooges physical comedy and repetitive interplay with Skippy about humans being monkeys. Alanson's world has a lot of potential, but this material is in need of a good editor. This novel and the last should be re-written into a single volume with at least half of the dialogue removed. I will probably finish this one out as i'm already 5 hours in, but much of it is painful and don't think I can handle another one. The narrator did the best that could be expected with the material he had to work with. I very much enjoyed the first book of this series. The Skippy character was amusing and added an interesting twist to the &quot;humanity caught up in intergalactic war&quot; style. However this book felt like a series of short stories, all with the same premise, execution, and resolution. As if the author was writing five different variations of the same story and stapled them together in one book. The formula got boring fast, and soon became frustrating. If you enjoy this series I highly recommend reading a paragraph summary rather than wasting your time with this filler, hardly anything important or interesting takes place. However I must commend R.C. Bray on his performance, it managed to get me through the otherwise mind-numbing writing. I would not recommend this book to anyone frankly. From Chapter 14 on it's like reading/ listening to the same chapter over and over again. In book one, the saving grace was Skippy, now he's become... just ... annoying. With the same &amp;quot;stupid monkey&amp;quot; or &amp;quot;masturbation&amp;quot; joke over and over again. It was honestly hard to get through. So much so that I don't think I'll continue to book 3. I wanted to BLUFF IT, but it is your money. I liked this book and will continue the series, but I did not love it. The book is very funny and that is what saves it. It does have some SCIENCY STUFF to the point of over my head. We are talking lots of physics with wormholes and flat universes. I like the main character Joe. I like the fact that he shows humility, but yet is in charge. It is entertaining 90% of the time. I liked the planet of the week, which this week is an Ice Planet. Keep in mind, I said I like the book and I am going to continue the series. When I listen to book 3, I will wear my lucky underwear. YEA, LUCKY UNDERWEAR IS A REAL THING. For the first hour or two, the sarcastic SKIPPY almost becomes too much. Almost every line is a sarcastic remark by him. I love this type of humor, but the first hour was annoying. The jokes are repeated so many times, that I found myself giving the sarcastic remark before Joe or Skippy did. You always know that Joe is going to think up something Skippy does not think up. You know that Skippy will get upset over that fact. You know that the solution will almost always involve Skippy listening in on the enemy's communications and often manipulating them to make the enemy see or hear something different than the truth. When it is not that, it will have something to do with Skippy making a small worm hole. After a while it became SEMPER TEDIUM. With all that, there is still some LOL moments towards the end and of course the love that is growing between Skippy and Joe. I am also very interested in the mystery of the Elders, along with a new mystery, involving an unknown race that is using Elder technology for evil uses. R.C. Bray is no idiot and I will always listen to him speak. I love the fact that it's 15 hours and it's something to keep my mind from going numb when I am on the treadmill, but just barely. The reader has a dynamic voice, which makes up for what the writing lacks. Characters don't develop so who they are on page 10 is who they are on page 1000 --- basically which part of the galaxy they replay the same skit over and over again changes but the book ends where it begins with character and plot development a good author could have accomplished in 3 paragraphs. I am heading to the gym, so I guess I use another credit and get the 3rd....oh well....here's to hoping. The budding bromance between Joe and Skippy is way overboard in this book. That and the repetitive crisis that stumps Skippy but Joe is able, with his monkey brain, come up with an technically ingenious solution - every time. It was a good formula in Book 1 but there is no need to beat readers over the head with it. 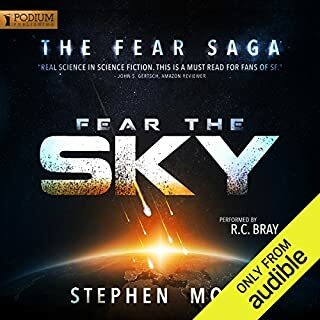 This book is like a modern action movie; there is no fear of impending doom concerning the good guys, they easily defeat the super villains every time. What disappointed you about SpecOps? Book 2 takes a few elements that worked fairly well in Book 1 and repeats them ad naseum to fill the pages. Did the publisher require a specific page count from the author? The plot is basically a loose collection of randomly appearing, insurmountable problems that end up being resolved by (1) Skippy, using another one of his god-like, deus ex machina powers that aren't mentioned until he explains the solution or (2) Joe's "brilliant" idea that Skippy for some reason could not foresee despite his superpowers, followed by Skippy's grudging acknowledgement of monkeys being smarter than he thought and "I hate my life and monkeys" screams.... Rinse and repeat N times to fill the book. The rest is filler without much character or plot development. We don't get much in terms of world building, interactions with various aliens or Elders, but we get a ton of pages about Newark. The constant banter between Joe and Skippy worked well in the first book, but eventually became really repetitive and formulaic. Also, Joe's constant inner monologue is cringe-worthy - we get it, you have a strong sense of duty to save everyone and also don't feel like you deserve the promotion to colonel, but how many times does it need to be mentioned??? No, if Book 3 in this series is like Book 2. I liked the first book, but this is just lazy. I'm a person who enjoys watching Sci-Fi, but im usually disappointed when I read it. This is the 2nd book in the trilogy and the author's style is definitely different, but it's a "good" kind of different! His choice of words and his ability to make me think and feel that it's entirely possible for an object that's shaped like a beer can that's, because it is the most intelligent being in the universe is a testament that the author' is creative and his book is worth listening to. I listened to book one when it first came out. It was amazing! When this book came out I figured I had to re-listen to the first before starting the 2nd and I did. Book 2 was a failure. The All Mighty skippy jokes got repeated so many times and towards to end he seemed like the monkey on the journey. So many repetitions like “Huh” and “what”, it gets incredibly frustrating. I really wanted to give this the 5 star I gave its predecessor. R C brey has done a outstanding job again. really enjoyable, just as good as the first book! I can't wait for the third book in the series. What did you like most about SpecOps? 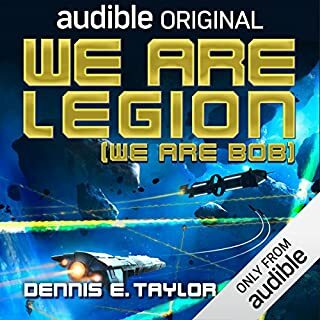 This audiobook is just a lot of fun. What was one of the most memorable moments of SpecOps? The whole adventure was enjoyable from start to finish. Which character – as performed by R.C. Bray – was your favourite? Skippy - the AI character is a bit of a one trick pony on the joke front, but somehow the joke always remains amusing. This book, in literary terms, probably does not stack up against the best scifi - but that is missing the point. It is great escapist fun and a thoroughly enjoyable listen. It sounded like Mr. Bray enjoyed reading it - and he did another great job. Please hurry with No. 3! More more more more more more more more more more more I need more. Forget Siri, We Need More Skippy! I think there's a very simple way to review this book. 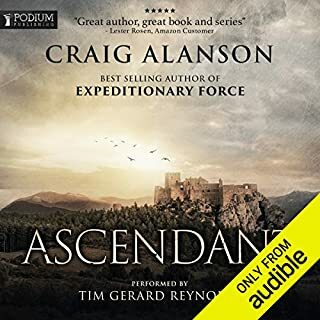 If you've read the first book and want some more, then get this book because the adventure just takes off in the same way. There's more Barney, more Skippy, more irreverent monkey insults and more great action. RC Bary the microphone maestro continues to do his thing and I grow more in awe of his talents as a narrator with every passing word I hear from him. He's on top form with this performance and I really get the impression that he has particularly enjoyed reading this series so far. 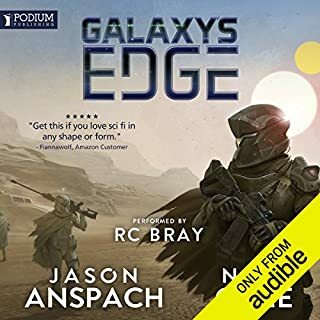 Even though this really is space opera and the kind of thing to give plot hole pedants nightmares Alanson creates a universe with a little depth, has interesting sci-fi ideas and gives his books a sense of action and adventure. Maybe I should grow up more but it had me both laughing out loud and rooting for Joe and his merry band of pirates the whole way through. So, when's the next one out? a series only to find that the next book is somewhat of an anti-climax. see, I am pretty enamoured with this writer and his superb story. compliment was 78. Perhaps simple typos but, really, who cares? "Corn Pone" and "Ski" are featured as they adapt to life under the Ruhar. reads I've had in a long while in this and any other genre for that matter. a decent story but a little repetitive, formulaic at times. having skippy be annoyed that he didn't think of an idea got old after the first time. by the end it was grating. 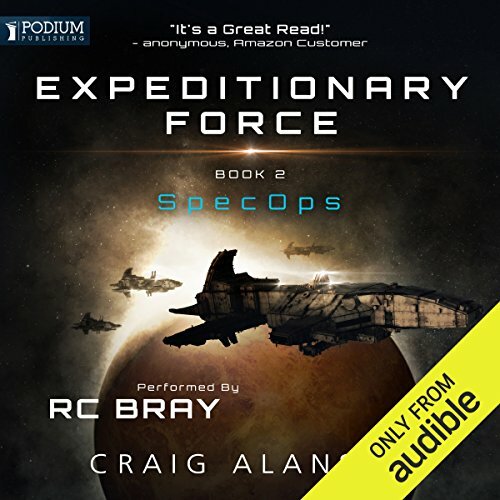 R.C Bray really brings to life all of the writers characters and makes the whole audio book experience even better. I really enjoyed book one. Despite the writer’s lazy need to invoke a superman (Skippy the AI) to provide frequent, impossible solutions to the challenges faces by Colonel Joe. Book two however.... is chapter after chapter of bloated narrative that contributes nothing to an enjoyable, rollicking story. Despite repeatedly jumping forward in the recording in vain attempts to locate plot developments I will abandon this series here. And now. Craig Alanson has a gift! Logic, suspense, technical knowledge, social awareness and an enlightening sense of humour. A gift to produce a magnificent story stitched together with a majestic and fluid style of writing. And hats of to RC bray for bringing the words , story and Characters to life. I love the relationship Joe and Skippy have - priceless! There is only so many times you can follow the formula of Skippy the Macguffin mocks human crew as dumb. Ship gets in trouble. Joe thinks of a cunning plan to get them out of trouble. AI has a tantrum because he didn’t think of it. I truely hope the author has that out of his system now as I continue the series. It’s a good continuation of the story and the law is building well but this book was far slower than the first and started to get slightly repetitive. I will buy the next one and hope that it’s a bit faster. Would recommend. Both scientifically plausible and funny. I found myself listening with every moment I had to spare. Loved it! Loved it! Loved it! Adventure of the Joe, Skippy the Magnificent and the Crew continues and if you loved the First book-this one is a MUST! I was originally worried about book 1. It was a little boring in the beginning. Then skippy came along and it became a favourite series. Book 2 didn’t have the slow beginning but was a little slow in parts. Still, a very enjoyable book that adds new depth. Have already bought book 3. Narrator was excellent.